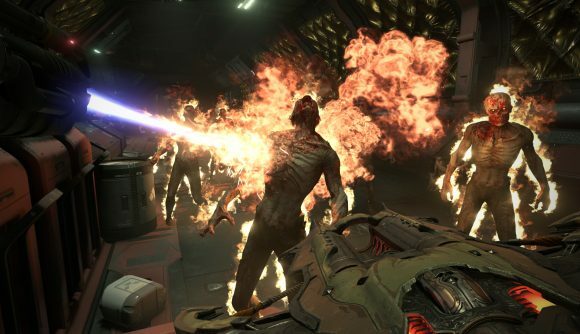 Doom Eternal will not have mod support at launch. After hearing the game’s developers speak at a roundtable Q&A during QuakeCon, we can say that much for certain. But id wants mods, and director Marty Stratton says that the studio has been revising its tech to make mods happen. Stratton says “We had made some technical decisions way back that just pushed us in a different direction than mods. We have spent the last several years making technical decisions that get us back towards being able to do mods. “It is a real, long-term initiative of ours to get back to where we can do that. Again, we’ve been making a lot of technical decisions that allow the tech – everything, the rendering, the way we do the gameplay, the way our levels are set up – really trying to make the game and the game code more flexible. Kind of put it in more components, and more data-driven in a lot of ways, which is how you get the mod content. Doom has a tremendous history of modding, to the point at which we’ve still been reporting on things like the Castlevania mod and the Doom loot box parody even within the past year. The lack of mod support was one of the big disappointments with Doom 2016, and since the new game is ditching SnapMap as well, it seems there won’t be any support for user-generated content on the Doom Eternal release date. “I hope down the road,” Stratton says, “in the not near future but the not too distant future, we can have a better conversation about that.” So keep hope alive, but don’t keep it too alive.